It is now strawberry season, here. 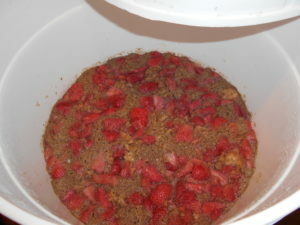 So walking around the farmer’s market I had the urge to try to brew a strawberry mead recipe. I picked up a flat (8 quarts) of strawberries. After removing the stems, I quartered them and split them into 3 large freezer bags. I also added a squirt of lemon juice to keep them fresh while I was cutting them. Then I threw them in the freezer to help break down the fruits’ cell walls. Then thawed one for the primary. This allows for the flavor to be extracted more efficiently. So the gravity may be a bit inaccurate due to the sugars in the fruit not being fully diffused into the liquid when I took the measurement. But I’m just looking for a ballpark figure. You may be wondering why the bananas. I’ve read they work as a very good compliment to the strawberry flavor. Strawberry is a tough one, as it is very light. Even eating the fruit itself, its mostly an after taste. On top of the flavor compliment, bananas are also supposed to impart a good amount of mouthfeel to the drink. I am excited to see how this turns out. Mouthfeel seems to be the biggest sticking point for a lot of my batches. They are all a bit thinner feeling than I’d like them to be. I’d suggest using a brew bag for the bananas, at the very least. The first few I added, I had forgotten to put them in one, and they essentially melted. So there will be a lot of sediment at the bottom of my container when this is done. 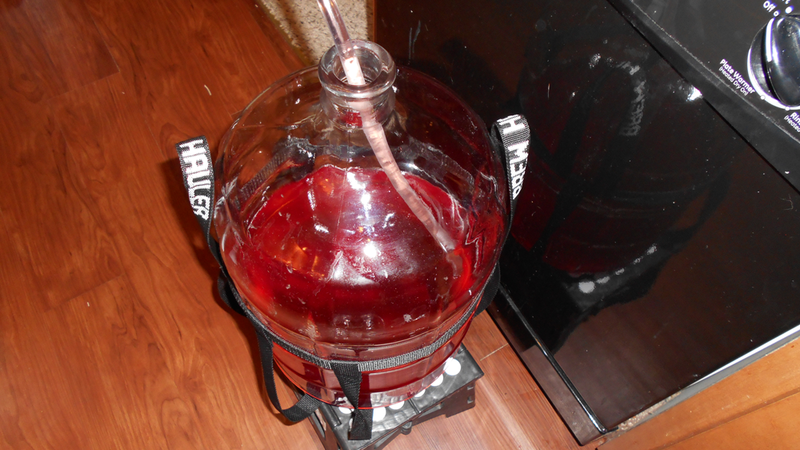 If you are attempting a strawberry melomel recipe, and are using a carboy, you will want to use a blow off tube instead of a regular airlock. 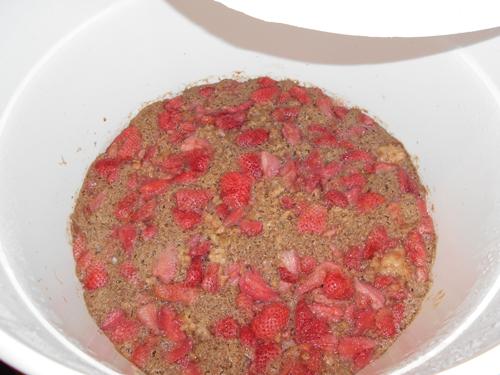 Strawberry is known to be promote quite a vigorous fermentation. Wider buckets shouldn’t have much of an issue if there is plenty of head space, but it might not be a bad idea anyway. I went light on the strawberry in the primary so mine hasn’t been an issue, yet. But with the combination of the bananas essentially melting, there is a large amount of krausen, or fermentation foam build up floating on top.